The OmniFlex AutoVac is an automated floor cleaning machine that's three-four times faster than mopping with one major difference: it actually removes the soils completely from the floor surface instead of spreading them around. Even more impressive, it rivals the performance of an auto scrubber - at a fraction of the cost! Also available, our newest AutoVac powered by Lithium-Ion. Toss the mop and use the AutoVac for daily cleaning of hallways, lobbies, aisle ways, entranceways, gyms, cafeterias and more. Many facilities even use it in place auto scrubbers. Plus, the cordless battery capability makes cleaning during the day easy, practical and safe. The AutoVac enables rapid, complete removal of spill contents to keep employees, customers and surfaces safe. Plus floors are clean and dry for immediate use. The portable AutoVac is perfect for weather-related cleaning like salt, water and mud pickup for improved floor safety and perfect first impressions. Its cordless capability and nimble maneuverability are perfect for cleaning throughout the day. No area of the building generates more complaints than the restroom. The AutoVac converts in seconds to a high performance restroom floor cleaning system. The AutoVac simplifies floor stripping. Just apply fresh stripper through the rear spigot and agitate as normal. Then, simply pick it up with the vacuum system. When ready, you can even dispense fresh rinse water and vacuum the floor dry. The precise flow of floor finish from the spigot along with smooth microfiber application provide a level coat of finish with no bubbles or streaks, eliminating costly redo's. It's easier than mopping. Simply open the spigot, turn the vacuum motor button 'on' and start walking. For starters, its initial purchase price is 10-25% of an equivalently sized autoscrubber, less than the average annual maintenance cost of most scrubbers. Training costs are virtually eliminated while productivity soars. Plus, in the rare occasion of a break down, it can be repaired in minutes with no technicians or tools. In comparative tests performed by a major university, the AutoVac system removed up to 99.8% of targeted soil. This actually surpassed an autoscrubber, which removed up to 99.4%. The new microfiber mop only removed up to 50.9%. Performance tests show that the AutoVac is 3 to 4 times faster than mopping and faster than many auto scrubbers. Its one-pass cleaning process lets users can clean more than 20,000 square feet (1860 sq m) per hour. Plus, most users won't have to dust mop before cleaning or trail mop after cleaning. Extreme cleaning and instant drying mean immediate availability and reduced slip-and-fall accidents. In fact, the system has been certified by the National Floor Safety Institute (NFSI) for providing High Traction. With so few moving parts, very little can go wrong with the AutoVac. And if it does, it can be maintained and repaired in minutes by non-technicians - without any tools. Don't let dirty entranceways and floors drive customers away. Maintaining a clean, inviting appearance throughout the day keeps customers coming back and employees motivated. 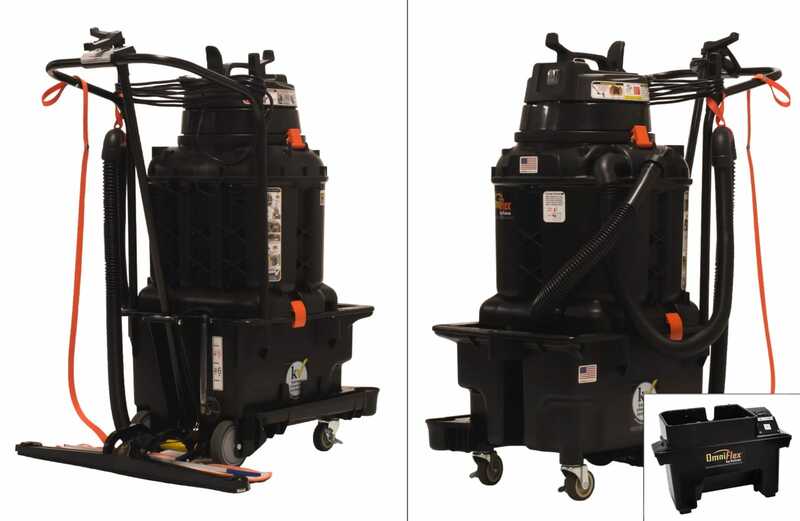 The AutoVac can be converted to pick up salt, mud, and spills, strip and finish floors, clean restrooms, extract grease, and even clean carpets and matting. The AutoVac system breaks down for easy cleaning access. Plus, it can go up or down stairs or across town in a small vehicle. AutoVac is available in both cordless and corded models for the ultimate in flexibility. The best part? You can switch between modes in seconds for the best of both worlds. The AutoVac drastically reduces chemical and water usage right out of the box. Not only does it clean more efficiently, but it also cleans so effectively that many environments can be cleaned with little to no chemicals. The AutoVac is also gentler on floors than an autoscrubber, reducing stripper and finish applications and extending the life cycle of your flooring. for evenly spreading cleaning solution. for efficient removal of soils and solution, leaving floors clean and dry. for collecting and containing soils and dirty solution. keeps cleaning solution always clean and fresh. allows quick and ergonomic draining of vacuum tank contents into a suitable toilet or sink. for hanging, storage and wrapping. allows operators to gauge the level of solution in the Trolley Bucket. with elongated spigot handle for easy "no-bend" control while dispensing solution. allows the operator to raise and lower the spreader pad and squeegee head with one hand - without bending. for high performance cordless cleaning. provides a convenient location to store the optional Vacuum Wand or optional Speed Spreader while collecting excess liquid. Kaivac’s Smart Battery Box incorporates advanced portable power technology to turn any OmniFlex AutoVac or Dispense-and-Vac system into a cordless unit in a matter of seconds. This means that cleaning professionals can move freely and quickly throughout the facility at any time of the day with virtually no boundaries -- or concern for power outlets and trip hazards. Even new employees can master effective floor care in minutes with this easy to learn and use capability. The OmniFlex Battery Box can be purchased as a standalone unit for converting an existing system to cordless. Or it’s available in preconfigured OmniFlex AutoVac and Dispense-and-Vac packages. A pH neutral daily cleaner that’s tough on soils but gentle on floors and finishes. It works great on virtually any hard surface flooring, like vinyl, stone, polished concrete, marble, rubber, epoxy, granite, ceramic and more. It’s ideal for use with the OmniFlex AutoVac but can also be applied using an automatic scrubber or a mopping system. Like all Kaivac chemicals, this neutral cleaner is designed specifically for use with our wet vacuum systems. In fact, we are so confident in the performance and suitability of our chemicals that we offer a lifetime warranty on our OmniFlex vacuum motor to customers who use them exclusively. Also available in 1 gallon jugs. Includes complete kit for installing a single Horn on an OmniFlex vacuum tank. Includes 1 Horn (OSTOB), hardware and tool for mounting the Horn along with an instruction sheet. Amanda Long, Offsite Manager, SW Resources, Inc.